What have I done for you lately? Not much. But, I'm making up for it with this post. 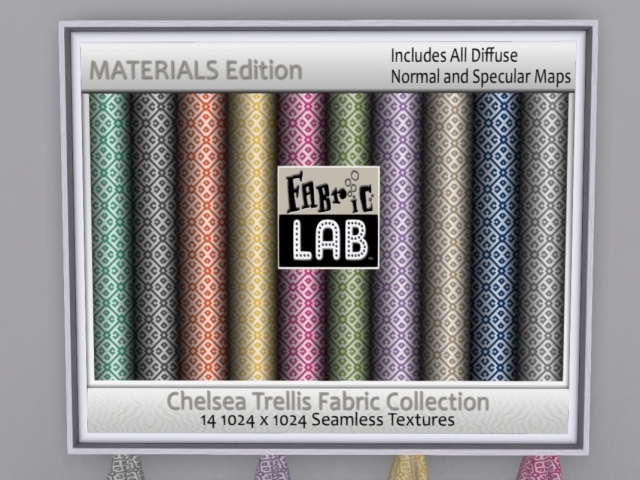 One of my favorite freebies is the monthly $1 texture pack from Fabric Lab. The picture at the top of this post is the pack for February. Isn't it delicious? It's so Spring-ish! It's even more delicious, no? It's very ROY G. BIV. There is a new Password Prize every three months. I have no idea what I will do with these textures, but I love them. I want to take them out and rub them all over my eyeballs! That's how much I love them. I get so excited about the potential of good textures. It's a darn good thing I am so organized or my texture habit would become a serious inventory problem. It's a real SLobsession. I have similar problems in RL with things like lipsticks. I have a million lipsticks and glosses and tints and stains, but 99.9% of the time I just wear one sheer rose gloss. But despite never using them, I love buying new lipsticks. Just to look at apparently. If only there were lipstick freebies in real life. By the way, don't forget that tonight we are playing Hollywood Prims at 5 pm SLT at Hooligan's! We need more people to come watch and play! It's worth your while because you can win fabulous cash prizes! If you win cash prizes, you can start your own texture SLaddiction!